Ky was a loving girl who is full of energy and just wanted to please. 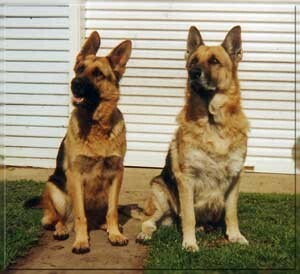 She was one of the first German Shepherds to obtain her Herding Title in NSW. She passed her C.C.D. (Community Companion Dog) Obedience Title with scores of 97, 94 and 95. Ky attained her Novice Obedience Title (C.D) with 3 passes in 3 trials with scores of 185, 189 and 183. 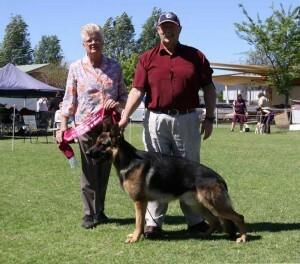 Ky at her first Open Trial at the Qld GSD Club, had an outstanding effort winning first place with 193 points and gaining an Excellent medallion. Her 2nd pass in Open was 3rd place at the Grafton Trial. At Coffs Harbour, she won first place in Open (A) to gain her CDX title. Many thanks to Paul,Daphne and Jamie for our sweet girl. 2015 was a great year for Krystal. She was the No. 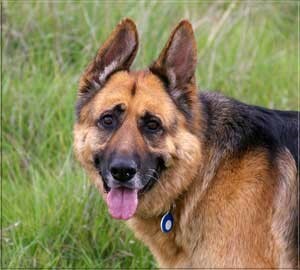 1 German Shepherd Dog – Breed Challenge Competition – New South Wales in the Dogz Online Pointscore competition. Krystal joined us at about 7 months. Since then, she has provided everyone with lots of laughs. She is another water dog and loves cuddles. Krystal is having great success in the Show ring with 4 Best in Groups, multiple Best of Breeds, a Runner up in Group, Puppy in Show, 3 x minor in groups and 11 Puppy in groups. Krystal won a Best in group at 11 months which enabled her to gain her Championship title. She has had an interrupted showing career due to maternal duties. “Anzac”Anzac, in his short but outstanding show career won 3 Best in Groups, a Runner up in group and 2 Runner Up Best in Shows. Anzac unfortunately passed away at 2 and a half years. He gave us many wonderful memories. RIP beautiful boy. Stryka, my good mate, passed away at 11 years of age. 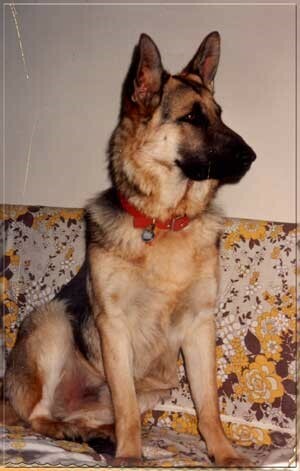 Stryka was my first shepherd and she was an outstanding girl who taught me so much. Stryka was a gentle and sweet soul who touched the hearts of many who met her. She loved playing fetch and doing obedience training. She was dependable in any situation. Stryka loved water, and was keen to help whenever you got the hose out. She was extremely loyal and always knew what I was thinking. Thanks for the wonderful memories my faithful companion. I shall always miss you. Oskar lived to the ripe old age of 12. He was a loving companion for Bob and he had a great life. He enjoyed chewing up sunglasses and screen doors. He loved laying on the couch and swimming. He was always ready for a dip in Lake Macquarie or the beach. Oskar was a great playmate for Stryka.